12 month program. $15 sign up fee $20 monthly thereafter, for 12 months. The Tapestry collection features 15 printed cotton fabrics inspired by batik designs. Rich classic tones in tan to almond lights with accents of gold & purple are nested in a palette of burgundy, navy and olive. This collection features two ombre fabrics that offer unique piecing opportunities. 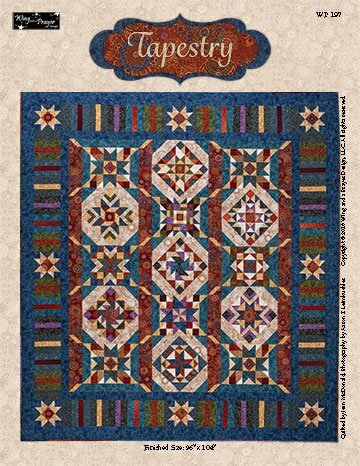 The 96“ x 104” Tapestry quilt is a great Sampler Quilt and you will learn many skills.